The OPP and the provincial government have said to the media that they want to “avoid another Ipperwash”, where Dudley George was killed by an OPP officer in 1995. OPP Deputy Commissioner Maurice Pilon says, "We hope a peaceful and lasting resolution can be achieved. Violence is not the answer." (CBC News, April 20, 2006) But the attempted invasion of April 20, 2006, the brutality used by police on the people at the camp, and the ongoing heavy police presence in the surrounding area shows that the police are prepared to use force to intimidate and repress Six Nations people. There have also been calls for Canada to call in the military against Six Nations people. Get the news out to as many people as possible. We know from the history at Kanehsatà:ke/Oka, Ts'peten/Gustafsen Lake, and Stoney Point/Ipperwash that public disinformation is a key state strategy. Use activist networks, personal networks, and media contacts to get the story out locally, nationally, and internationally. After the siege at Ts'peten/Gustafsen Lake police admitted they had deliberately used the media to further their "smear and disinformation campaign". Monitor the media covering the siege, and support Aboriginal and independent media providing accurate information about the history behind the blockade. CKRZ 100.3 FM is the radio station on the Six Nations reserve. If you can, go to the camp to stand in solidarity with Six Nations people and be witnesses to any further aggression. There is a rides message board at http://excoboard.com/exco/forum.php?forumid=91715 with detailed driving directions. People at the camp have asked that supporters arrive during daylight. Be prepared to look after your own needs, and if you can bring supplies to support others. There is a detailed list of needed supplies at http://excoboard.com/exco/forum.php?forumid=91715. At minimum dress warmly, and bring rain gear, a tent and tarps, blankets/sleeping bags, non-perishable food, a large quantity of water, flashlights, and batteries. Be prepared for rainy and cold conditions. To assist in documentation, if possible bring still cameras, video cameras, and battery-operated tape recorders (with several sets of replacement batteries). Regular unleaded gas for the generator is also appreciated. The blockade is on a construction site, so expect mud, wind, and rough, improvised accommodations. Medical supplies, personal hygiene products, food, and a variety of other products are needed at the camp. There is a detailed list of needed supplies at http://excoboard.com/exco/forum.php?forumid=91715. Money can also be donated by people who can't bring supplies directly to the camp (this is more cost-effective than paying to ship supplies). People wanting to make donations can call 519-445-0719 or email thebasketcase@on.aibn.com. It is essential that it be made clear that the world is watching. Click here for an archive of letters. Click here to sign a petition calling for a removal of police forces, cessation of development, and the return of stolen lands to Six Nations people. On April 11 and 12, solidarity actions took place in North Battleford, Montreal, Toronto, Saskatoon, Vancouver, and Victoria. 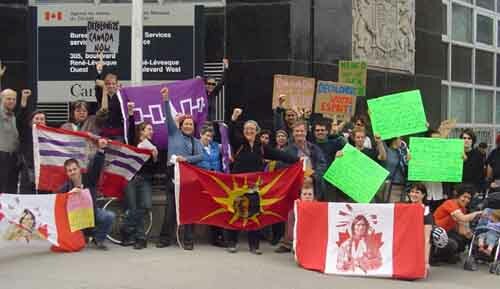 After the police invasion on April 20, emergency solidarity actions were taken by Mohawks from Akwesasne, Kahnawake, and Tyendinaga, and by supporters in Montreal. After the mob attacks on May 22, solidarity actions took place at Tyendinaga and North Battleford. Further actions are needed at Ontario government locations and at federal buildings in other areas to keep the pressure on. Click here for an archive of solidarity statements.